Kenny Omega returned to New Japan Pro Wrestling, teaming with Adam Cole to defeat The Briscoes. Champions and challengers for tomorrow’s two big title matches all looked dominant. After their first encounter, Cody made it clear the issues he has with Shibata are far from over. War Machine and the Young Bucks had an all out encounter, with the larger of the two teams scoring a big win. Young cut a promo before the match saying how the crowd was disrespecting him and how he and his teammates were real men, before all of Chaos attacked the faces to kick off the match. From there, it progressed to a really strong opening bout. Juice Robinson looked really good here. KUSHIDA and Finlay busted out double topes on the outside as Robinson hit the Pulp Friction on Gedo for the win. The faces went into the crowd to slap hands with people after the match. Somewhere near the end it looked like Robinson broke his nose, it was a bloody mess. Pretty good match. EVIL and Delirious started things off. It soon became a brawl with everyone fighting on the outside. Mostly a good back and forth match that the crowd got into. Delirious got some great near falls that the crowd got into. SANADA floated over with a German suplex and sent Delirious into the ropes, where EVIL smacked him with a steel chair. SANADA sunk in the Skull End for the submission victory. SANADA wrapped up Kawato in a ball after the match, something Milano Collection AT used to do. Announcers on (English) commentary wondered why Los Ingobernables de Japon keep picking on Milano. This also went to the outside, where Roa smacked Okada with the ring bell so hard the bell actually rang. Okada and Fale went at it and built up to a pretty good spot where Okada fought and fought until he finally bodyslammed him. Yujiro and YOSHI-HASHI also worked together, with the former hitting the Miami Shine but YH kicked out. After Goto cleared house, YOSHI-HASHI picked up the win, pinning Takahashi with Karma. This was a great match that built really well, with some great spots. The crowd even chanted “This is awesome” at one point. Hanson and Rowe started things off early but Hanson took out his partner by accident as the Bucks gained the advantage. Bucks went for double suicide dives but War Machine grabbed them both and threw them into one another. Matt springboarded across two top ropes and landed a great looking tope to the outside. War Machine gained control and went for the Fallout but the Bucks fought back. They somehow did a move where Hanson grabbed Rowe, but was so out of it the Bucks superkicked him in the legs, laying out Rowe with a sit-out powerbomb in the process. Bucks went for the Meltzer Driver but Hanson grabbed one of the Bucks in mid-flip. They hit a pop-up powerslam. Matt made a brief comeback, but was cut off as War Machine hit Fallout for the win. Tanahashi and Taguchi were dressed as the Boys and did the whole bit for Dalton Castle. Naito worked on Tanahashi’s knee. Basic, solid match as everyone worked with their rival. It boiled down to Martinez and Castle, with Castle blocking Martinez’s South from Heaven chokeslam finisher. Martinez cut him off and was able to hit it after a second attempt. Makes sense as he’s facing Goto for the NEVER title tomorrow. The rest of LIJ tried to fist bump Martinez after the match in a show of solidarity, but he just stared them down. Naito responded by flipping him off. This was a solid bout. 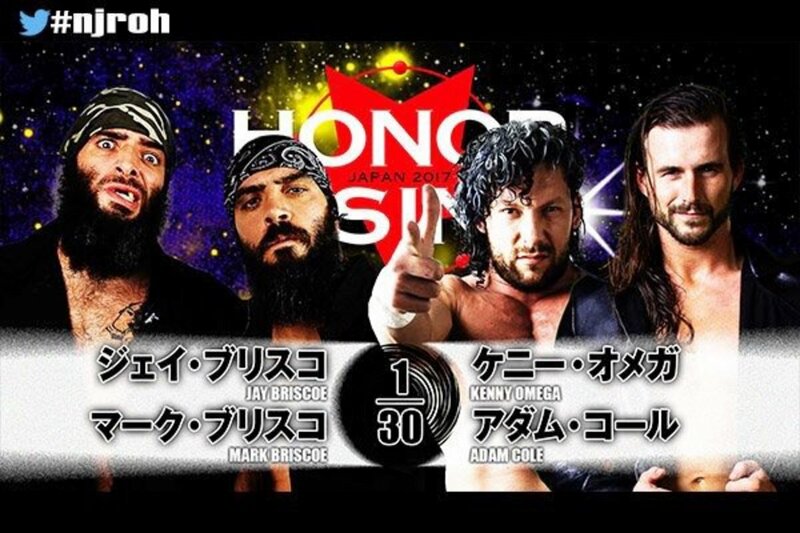 I thought the work between Page and Lethal was the highlight, but I think they’re building towards a Shibata/Cody match soon so that kind of makes sense. Speaking of, Cody can mark another checkmark off his list as he and Shibata started things off. They did some mat wrestling. Shibata went for the PK but Cody ducked and tagged in Page. He and Lethal worked for a long time and looked good. Page even did that great shooting star press dive, wiping out Lethal. Shibata and Cody were back in for a moment but Shibata took out Cody with an STO. Lethal and Page were at it when Cody came in and tried to take out Lethal with the Cross Rhodes. Shibata laid out Cody with the penalty kick and Lethal followed with the Lethal Injection for the win. Cody roughed up Shibata after the match, then bailed as Lethal and Shibata shook hands in the ring. Good main event. Hot action, some good spots, and great back and forth action. Kenny Omega came out to a great reaction and milked it for all it was worth. Cole and Omega teased some communication problems early. The Briscoes slammed Omega on the mat and undid the mats. They went for an assisted Jay Driller on the exposed area but Omega back body dropped Mark on the outside, then laid them out with a moonsault off the barricade. It turned into a pretty good back and forth match. Cole and Mark Briscoe worked really well with one another. Briscoes went for the Doomsday Device but Omega somehow countered with a belly-to-belly suplex to the mat. Omega struck with the V-Trigger knee strike and Adam Cole followed with the Last Shot for the win, pinning Mark Briscoe. Kenny Omega started to cut a promo when Adam Cole cut him off. Cole said he forgot the most important thing, that Adam Cole is in New Japan as well, he’s the ROH Champion, and 2017 is going to be his year. Omega said that’s nice and all, but the problem is you don’t speak Japanese and these people don’t understand. It seemed like they were building tension between the two. The audience laughed as Omega did his catchphrase to end the show, with Cole looking none too pleased. This was a really solid show in-ring wise. Everything delivered and everyone looked good, for the most part. Everything also built really well towards the next night, as Goto, Martinez, Cole, and YOSHI-HASHI all looked good tonight for their big title matches tomorrow. If there's one match you gotta check out, see the Young Bucks vs. War Machine. Both teams are really hitting their stride right now and this match was a great example of that.